Gamer. Martial Artist. Podcaster. Music Listener. Movie Watcher. Marius Dunkley has hosted 115 Episodes. Join Bruno, Jo and Marius on this special edition of the Monkey Tail Podcast. On this episode we list our individual top 5 games of the year and ask the question everyone is asking... was 2017 the best year in video game history? Join Bruno, Jo and Marius on another edition of the Monkey Tail Podcast. On this episode we talk about the games we've playing the past couple of weeks, including Destiny 2, Super Mario Odyssey, Animal Crossing: Pocket Camp and The Legend of Zelda: Breath of the Wild. Join Bruno, Jo and Marius on another edition of the Monkey Tail Podcast. On this episode we talk about the games we've playing the past couple of weeks, including Super Mario Odyssey, Horizon Zero Dawn: The Frozen Wilds, Sairento VR & Scanner Sombre. 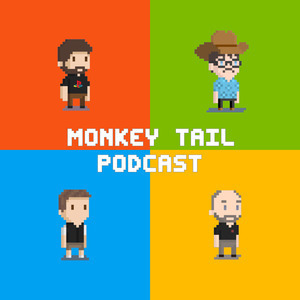 Join Bruno, Jo, Marius and Benn on another edition of the Monkey Tail Podcast. On this episode we talk about the games we've playing the past couple of weeks, including Super Mario Odyssey, Sociable Soccer, Stories Untold & Hellblade: Senua's Sacrifice. Join Bruno, Marius and Benn on another edition of the Monkey Tail Podcast. On this episode we talk about the games we've playing the past couple of weeks, including The Evil Within 2, Star Wars Battlefront 2, Golf Story and Mario + Rabbids Kingdom Battle. Join Bruno and Marius on another edition of the Monkey Tail Podcast as they celebrate International Podcast Day by discussing the favorite podcasts they listen to. There's also the usual video game chat, on this episode Cuphead, Yooka-Laylee, Uncharted: The Lost Legacy, Mario + Rabbids Kingdom Battle and Rec Room: Quest Mode are reviewed. Join Bruno and Marius on a special edition of the Monkey Tail Podcast where we talk all things EGX 2017, including Super Mario Odyssey, Detroit: Become Human, Cuphead, Strange Brigade & more. 74: If in doubt, be a d##k! Join Bruno, Marius and Jo on another edition of the Monkey Tail Podcast. On this episode we talk about the games we've playing the past couple of weeks, including SteamWorld Dig 2, Crash Observer, Deceit and WipEout Omega Collection. Join Benn, Bruno, Marius and Jo as they embark on a very special 24 hour gaming marathon, in aid of the fantastic charity Special Effect. Cue much gaming hilarity, from Mario Kart tournaments to the adventures of the snooze cheat. Join Bruno, Marius and Jo on another edition of the Monkey Tail Podcast. On this episode we talk about the games we've playing the past couple of weeks, including Hellblade: Senua's Sacrifice, No Man's Sky, Rust and SUPERHOT VR. 71: Because of polygons and $#*! Join Bruno, Marius and Jo on another edition of the Monkey Tail Podcast. On this episode we talk about the games we've playing the past couple of weeks, including NieR:Automata, Game of Thrones, Dead Cells and PlayerUnknown's Battlegrounds. Join Bruno, Marius and Benn on another edition of the Monkey Tail Podcast. On this episode we talk about the games we've playing the past couple of weeks, including Tekken 7, Nex Machina, Dead Cells and PlayerUnknown's Battlegrounds. Join Bruno and Marius on a special edition of the Monkey Tail Podcast. On this episode we cover Ubisoft, Sony & Nintendo conferences of E3 2017.